"An excellent venue. Bearing in mind this is a runs water and it certainly delivers on this. Over 25 bites for the week and landed 16 fish up to 34lb. Facilities are first class." "A superb week at the lake. Very welcoming on arrival, gorgeous looking lake and brilliant catches. Finished the week with 30+ fish, biggest 42.5. Highly recommended." "The lake is acquiring too many smaller fish from successful spawning years and needs to be netted and removed. 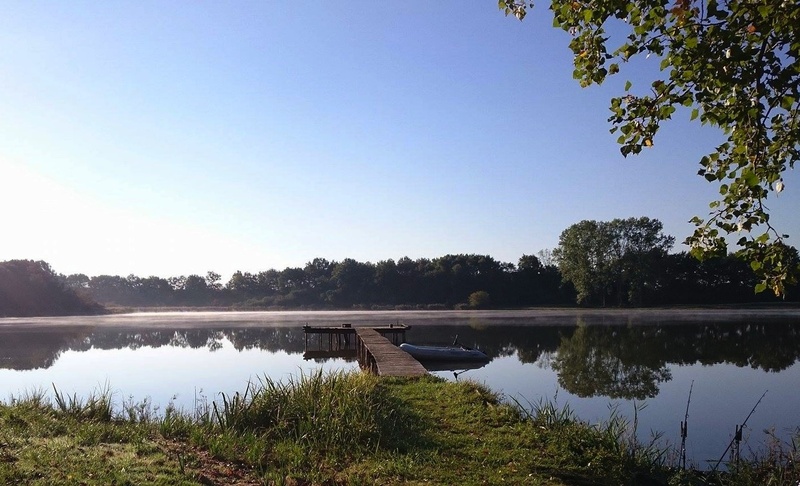 I had 41 fish from swim 9 but average was only 10kilo John molloy"
Etang de Mont is located in the Auvergne: one of France's hidden treasures, a region of beautiful valleys, large expanses of coniferous forests, and spectacular landscapes. It's a long 45 acres lake (18ha) that stretches out over more than 1 kilometer with a width of about 200 meters. All swims are situated on the northern bank. There are woods on the southern banks that provide some overhanging trees onto the lake. The 9 swims - including an island pitch - are equipped with luxury furnished tents (including 2 full sized single beds). 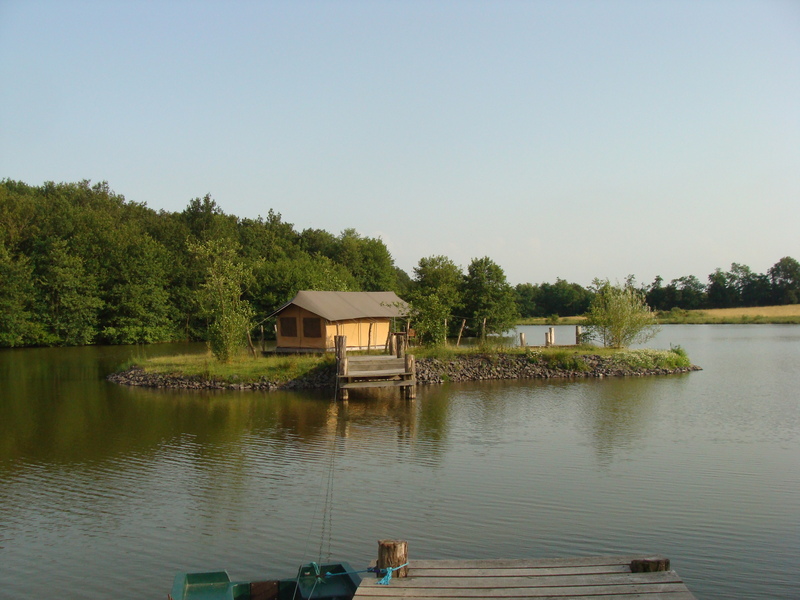 Etang de Mont is a great venue for those who like some comfort. The owner confirms that the lake is stocked (latest restock was in 2010) with about 1000 carp. No carp weighs less than 16lb (7kg). The biggest carp - a mirror carp - weighs 60lb (27kg), the biggest common is 46lb (21kg). 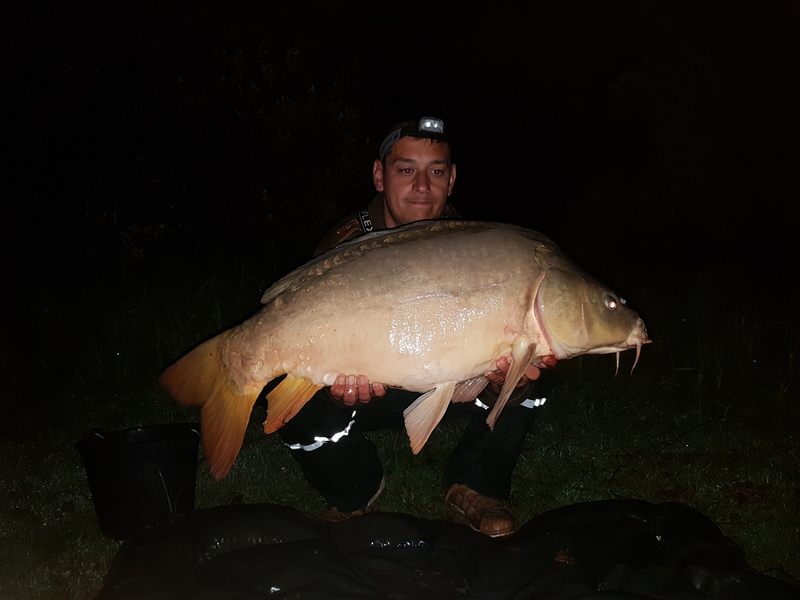 The average weight is 26lb (12kg) and there are very nice individual carp such as a 31lb leather carp, a 40lb Koi and a 46lb grass carp. Etang de Mont also has a nice head of sturgeon (max. 35kg), pike and silver fish. Take into account that there are poisson chat, so be prepared with tiger nuts and other techniques to avoid these fish. 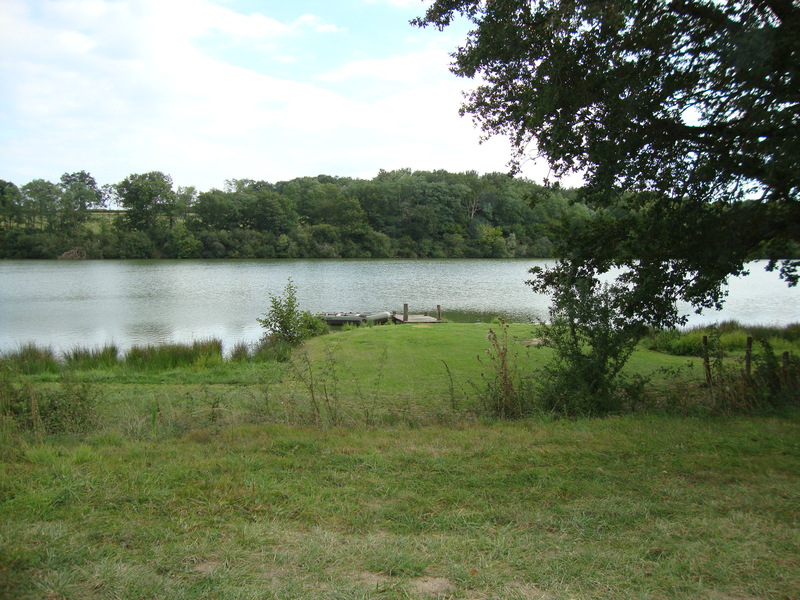 The lake is particularly long: 1.2kms and with a good width (on average 200m). 8 of the 9 swims are situated on the same side, so there is no cross over. 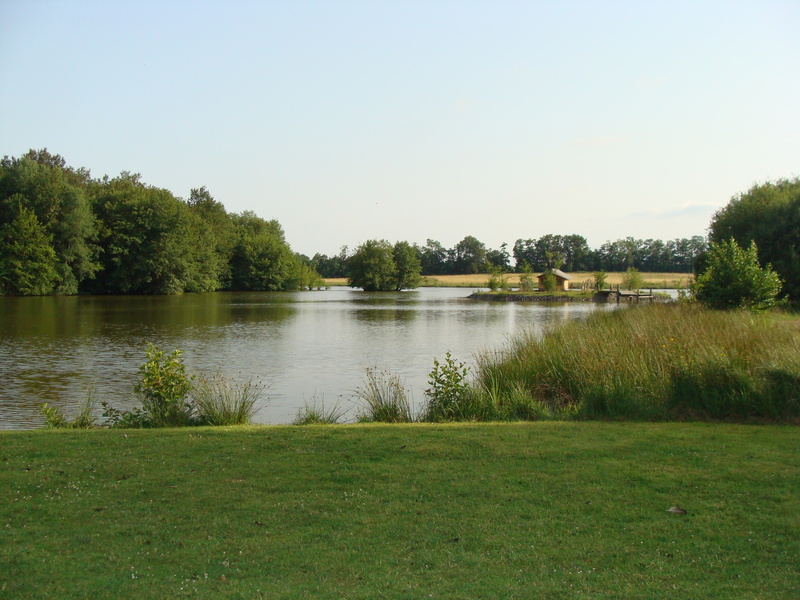 The 9th swim is on a small island in the lake and can be reached with a boat provided by the venue. This swim is not an easy swim: there are many snags that are not always visible (poles, branches, etc). Each swim is no less than 100m from the next, so everyone can fish in peace from their own swim. Each swim is terraced and is 15x8; it provides enough space and cover for the fisherman and the fish. The swim is equipped with the 2/3 person tent free of charge. The tents are furnished, equipped with wooden garden furniture, 2 full size beds with mattresses, table and chairs. Almost all swims have shade from an oak behind the swim, except for swims 7 and 9. All swims are double swims, but you don't have to double up. The single use of a swim is €50 EUR more expensive, but for this price, you're allowed to use 4 rods instead of 3. The facilities are well maintained and are clean. There are showers and toilets to the right of the lake, and a reception area with fridge for storage of drinks, as well as sockets for phone charging. You can buy food and drinks in the village of Beaulon. The bailiff Laetitia visits the clients almost every day to see if everything is ok. Pets are allowed. Barbecues are allowed. Boat hire: €50 EUR per week. 3. Each swim must have at least one boat. You can bring your own boat or hire one on site. If you wish to rent one at the venue, please indicate this with enough time in advance. You may use baitboats. 5. Allowed rigs: “carp friendly” rigs (safety bolt rigs), barbless hooks (max. size 2) and nylon mainline. The hooklink may be stiff or braided, but should allways be less strong than the main line. 6. Not Allowed: carp sacs, bent hooks, braided mainline, peanuts. Lead Core is not allowed. Rig tube is allowed. 7. 4 Rods per angler if you fish alone. 3 Rods per angler if you double up. Bivvies and tents should be brown or green. 15. Arrival after 14.00 h. Departure before 11.00 h.